Seasonal Occurrence: Occasional in spring and fall. Notes by Susan Billetdeaux: One of the confusing "empids" (grayish plumage with pale wing-bars and eye-rings), Willow Flycatchers are best identified by their call, a harsh fitz-bew with strong accent on the first syllable. Alder Flycatchers and Willow Flycatchers formerly were considered one species, "Traill's Flycatcher", and many birders continue that tradition. They are extremely difficult to separate by visual means alone. Willow Flycatchers breed from Maine to British Columbia and as far south as Georgia, Arizona, and south California, but it only breeds in areas with flowing water. 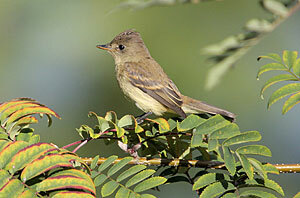 Comments by Don Verser: Apparently less common than Alder Flycatcher on the Upper Texas Coast. Identification very difficult. Need to associate vocalization with observation. Willow gives a strong "whit" call note similar to Least. Larger empids with strong tricolored underparts i.e., white throat, gray breast, and yellowish belly, are suggestive of Alder/Willow. Willows have little to no eye ring.